U.S. President Donald Trump speaks with French President Emmanuel Macron prior to their meeting at the Elysee Palace in Paris on Nov. 10, 2018. 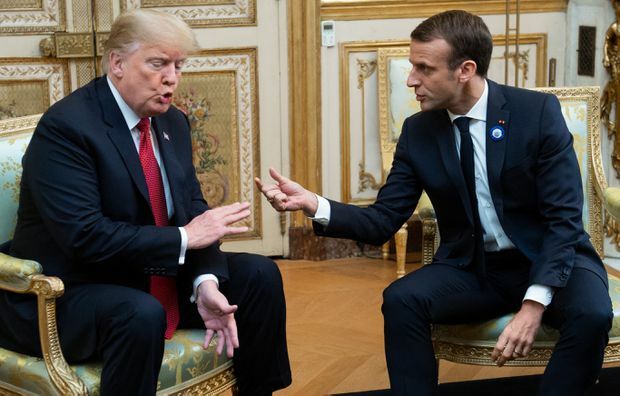 U.S. President Donald Trump attacked his French counterpart on Tuesday in a series of tweets that underscored how much the once-friendly ties between the two leaders have soured, just two days after returning from Paris. In five posts sent on the same day that French officials marked the anniversary of the 2015 terrorist attacks that killed 130 people in Paris, Trump blasted the key U.S. ally over its near defeat to Germany in two world wars, its wine industry and Emmanuel Macron’s approval ratings. Trump also travelled in a motorcade to the Armistice commemoration while most other world leaders walked the last 100 meters (328 ft) or so to the ceremony at the Arc de Triomphe. The weekend started uncomfortably. Before his arrival, Trump had blasted comments that Macron made in a radio interview in which he appeared to cast the United States as a threat. But on Sunday, Macron delivered his hard-hitting remarks.